There is a certain stand of trees at Avebury I’ve long wanted to see. 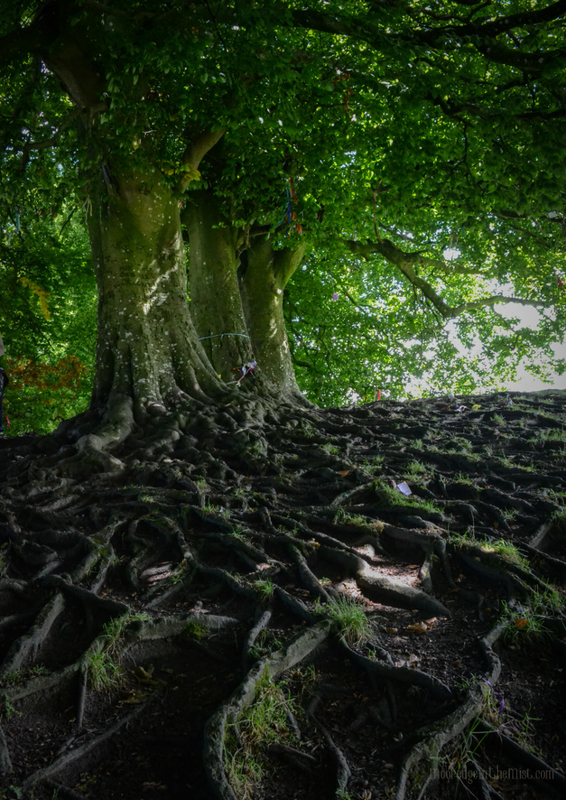 Four large beech trees with the most magnificent roots which snake down the embankment like a river of runes. They are quite awe-inspiring at first glance, towering above the path with their dense canopy of green. In amongst the green, you begin to notice the other colours, bright ribbons tied around the twigs and roots, loose ends drifting in the breeze. Offerings left by other awestruck visitors who have made the same journey to this special place. The longer you stand the more you notice. Little notes, pleas for health and happiness. Oh. And a bus ticket. Then a plastic hair bobble and beaded bracelets. The curling plastic ribbon that is usually found tied around a birthday present or supermarket bouquet. Fake flowers and laminated cards and down in the roots are tucked more trinkets. And so many bright, bright ribbons tied so very tight around every root and branch and twig. Of course, if you are making a wish you want to tie it on as tight as possible, so it may hold fast until your wish is granted. Right? 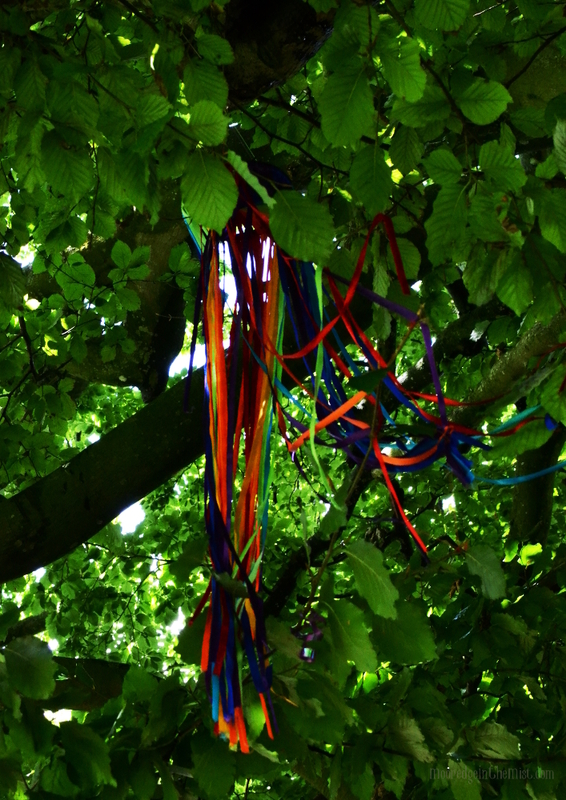 There is a long tradition of tying rags and ribbons to trees in Britain. These wishing trees, or Clootie trees, are found all over the land, particularly in the Celtic areas. Often the trees are found near holy wells and springs. The act of tying the cloth is a wish, usually for healing. The cloth should be dipped in the healing waters of the well and wiped over the afflicted area of the body, before being tied to the tree. As the cloth decays the ailment should dissipate. No one is really sure how this practice came about, however it is generally accepted to be very old indeed. It is rather thrilling to think we’re continuing a tradition which may date back thousands of years. It is a connection to our ancestors, who were also drawn to these sacred sites. Like casting a coin into a wishing well, tying that ribbon is a little act of magic we can all believe in. However, looking at all the evidence of human wish-making adorning the trees I was struck with the uneasy feeling that these acts were more to do with our human need to leave a mark, to say “I WAS HERE”. Several years ago I visted St Nectan’s Glen in Cornwall. There too is a well-established practice of leaving offerings and memorials. I saw all manner of modern offerings stuffed in crevices in the rocks and hanging from trees. Car keys, plastic sunglasses, teddy bears. Despite being a place of immense natural beauty, it felt unwelcoming. These manmade items felt like they were crowding out the true spirit of the place. The same is true at many other sacred sites all over the country. Unlike our ancestor’s offerings, most modern ribbons are synthetic. They will wave in the wind most prettily and fade over time, but never rot away. If they are tied tightly they begin to cut into the branch or root as the tree grows over time. This hardly seems like an appropriate offering, whatever your beliefs. And I feel, even less appropriate, are the items made of plastic which will never degrade and could even prove hazardous to wildlife and other visitors. How many pairs of plastic sunglasses before a site looks more like a seaside trinket stall than a sacred place? For me personally, I prefer to leave nothing physical behind at all. Any wish making I may do is whispered to the breeze and is between myself and the spirits of the place. While I can completely understand the need to want to leave some sort of offering, it would be helpful to be respectful of the site and the environment. Please make sure that offering is at the very least biodegradable. These special places have endured through the centuries and will hopefully be here for centuries after we have gone. Let’s not have our descendants have to pick their way through mounds of plastic before they can experience these places for themselves. I very much agree with you Bryony. When I visited St Nectans Glen this summer, I was quite surprised at how many ‘offerings’ were cluttering the place. I’ve been there many times over the years and I’ve definitely noticed an increase in these offerings, and especially the amount of plastic and just ‘things’ being left. It really does look like people just wanted to mark there presence with whatever they had in their pockets. Personally, I find it very sad and feel that a lot of these special, beautiful places are being spoiled. It changes the atmosphere, look and feel of a place, as well as being very environmentally unfriendly. It really defeats the purpose of honouring nature?! I didn’t mind a few ribbons blowing in the breeze on a tree, or a handmade offering of natural materials. I have tied a few ribbons myself in the past, and I really understand the compelling need to leave something or make a wish, but recently I have stopped leaving things unless it’s just a stone, shell or other natural object or material. Most of the time I will just make a silent prayer, or maybe drum for a while but leave nothing. I’ve become very aware of the issue….and it has become an issue, and I really think it needs to be changed in order to respect our land and return our sacred sites to their natural beauty. There are other ways to connect with these sites, without making it look like a tourist trinket stall. Ah that’s a shame about St Nectan’s Glen. I’d hoped the change of ownership would mean the site was better tended. I suppose sites like these become victims of their own popularity. As more people visit, more trinkets are being left. I hope the custodians of these sites regularly clear away the more inappropriate items. At Avebury I couldn’t see anything that was dated before 2017, so I think it does get cleared at least annually. However that makes me wonder what happens to the things taken away. Thrown in the bin and taken to landfill I guess (which has problems of its own!). Rocky Valley isn’t that different now, I saw all sorts there last time we went. I find it really sad. Places of outstanding natural beauty should be left as just that! Also, if you do perform a ritual or rite at a sacred site it’s only right if your clear up after yourself. I have seen lots of remnants of ceremonies etc.. left at stone circles etc.. down here. 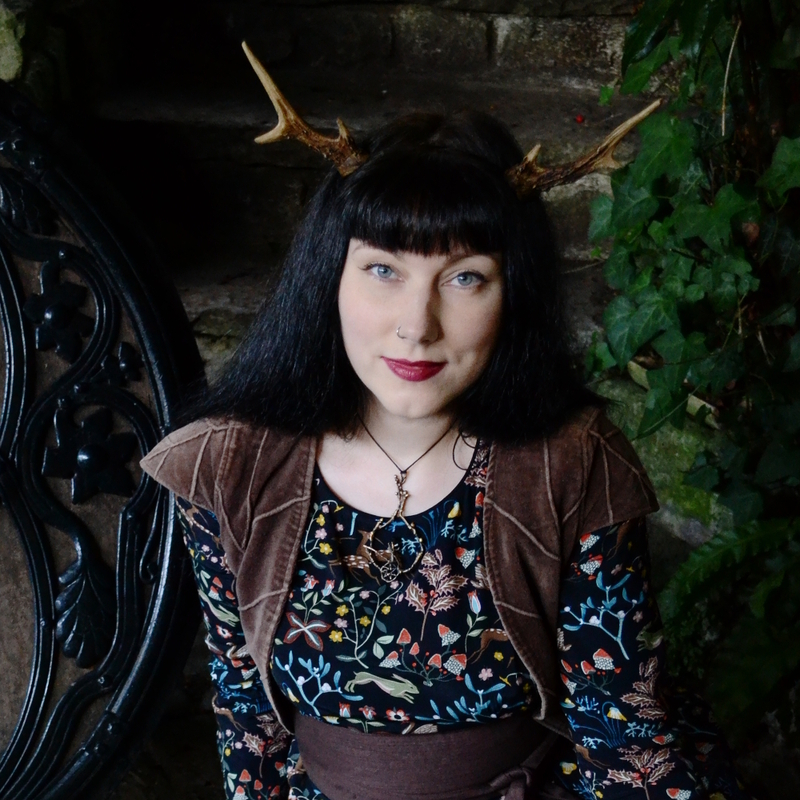 It’s very sad that people who identify as Pagan (assuming they’re Pagan rituals…) are not more conscious about the impact of what is left behind.